Best part: A gravely Rourke. Worst part: The Hyper-hyper-hyper-kinetic style. Acclaimed director Tony Scott defined the era of the loud, artistic action set piece with his smash hit Top Gun. Since then however his style has overpowered several of his productions. This still might have been acceptable if it didn’t reach the point of being completely overbearing. Domino is however the last straw, with every frame a clear call for better editing and cinematography needed from the once great action filmmaker. 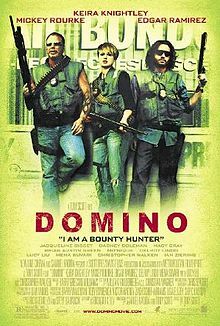 Following the supposedly true story of bounty hunter Domino Harvey, she never becomes interesting, mostly due to her brash nature. The tough chick persona is OTT in many regards, down to flashy tattoos, blond emo-fringe, male clothing and piercings draping her near skeleton-like frame. The story is told through her current drug trip, during an interrogation with a sassy interrogator (Lucy Liu). Sure, being on an actual drug trip might be enjoyable, but we are subjected to a non-stop flood of quick cuts, shaking cameras, lens flares and overlapping images. She is joined by a convoy of followers, including two fellow bounty hunters (Mickey Rourke and Edgar Ramirez) involved in all counts of murder, extortion and pot smoking. For bounty hunters, they sure do live an unsubtle life. For some reason they agree to be followed around by a camera crew filming a strange new reality show, tracking the whereabouts of America’s most dangerous offenders. This ridiculous subplot, featuring a phony near-cameo performance from Christopher Walken, is one of many ideas trying to bring pathos to this ultra-dumb super trooper story. If you were one of the biggest criminals in America, why would you want to be so blatantly identified anyway? If these characters had any common sense they might have thought ahead. Scott does however manage to pull of gunfights with stylish choreography and chilling sound effects with technical precision. Every bullet is fired with a loud ring, particularly effective during a horrifyingly violent scene of operation in the back of a bus. Verdict: A messy and irritating crime-thriller.